Mary was born to George and Anne (Kaleszar) Santer in Sauk Centre, MN on March 16, 1932. She attended country school until sixth grade and then graduated from Osakis High School in 1951. She worked at an orphanage for boys in the Twin Cities for a period of time and then at Herberger's in Osakis before marrying Bernard Zins on April 27, 1954. Following the wedding and after nine moves around the Alexandria/ Osakis/ Pine River and Melrose areas, in July of 1966 they settled on a ten acre hobby farm seven miles northeast of Osakis. Mary and Bernard raised fourteen children on this farm. Mary was a member of the Immaculate Conception parish and belonged to the Christian Mothers and the Daughters of Isabella. 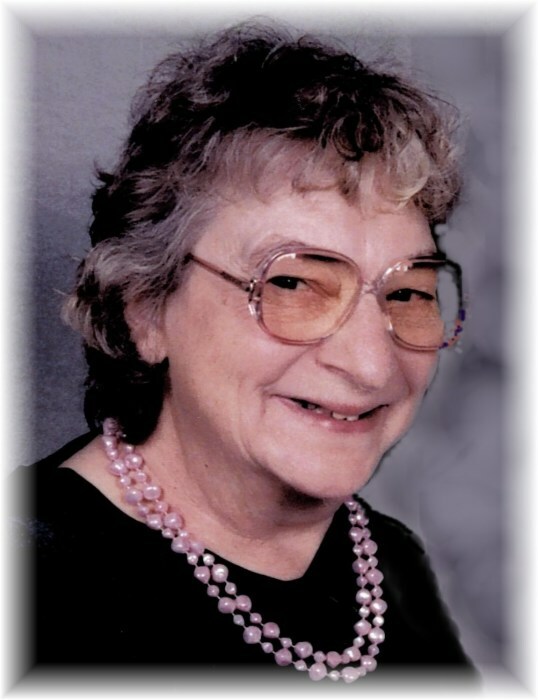 She was also a life member of the Osakis VFW Auxiliary and was a past Osakis Legion Auxiliary member. Mary belonged to a community birthday club and enjoyed visits with her friends and neighbors. She had many hobbies that brought her joy – her flowers, playing cards, bell collection, embroidery and crocheting, her chickens, dogs and vegetable garden. For the last ten years she had also been working on her autobiography. Her greatest joy however was her family and her heavenly Father. Mary did a lot of baking to feed the family. Goodies all year long. Her famous chocolate cake and boiled chocolate frosting will be missed. She didn’t use a recipe so no one will be able to copy it. Her canning season would fill the basement shelves. What a wonderful winter blessing. Mary was the family’s faith foundation and taught her children to lean on their faith. She also taught them to never take anything for granted and to follow the Golden Rule. Often friends of her children would find themselves calling her mom because she made them feel so much at home when they were in her presence. Mary prayed often to the Blessed Virgin Mary for guidance in her role as a mother. Anyone that was in her home would find a Holy Family picture, statue or rosary in every room of the house. Mary will live on in the hearts of her family and her presence will be missed by those who knew her. Mary is survived by her children, Daniel (Linda) Zins of Osakis, Kathy (Richard) Hagen of Glenwood, Cindy Houff of Osakis, Denice (William) Klimek of Osakis, Richard (Kim) Zins of Glenwood, Alan (Cindy) Zins of Sebeka, Karen (Keith) Nelson of Alexandria, Kay (David) Verkuilen of Little Falls, Dale (Jenna) Zins of Nelson, Dean Zins of Osakis and Dave (Ruth) Zins of Glenwood; daughter-in-law, Deb Nelson of Glenwood; son-in-law, David Nelson of Nelson; 49 grandchildren; 52 great grandchildren; brothers and sisters, Joseph (Carol) Santer of Anoka, George, Jr., (Mary Jo) Santer of Browerville, Donald Santer of Spring Lake Park, Alvina Waldorf of Osakis, Yvonne (Leroy) Zenner of Richmond, Arlene Sutton of Brooklyn Center; many nieces and nephews. Preceding her in death are her parents, her husband, sons, Mark and Mike Zins, a daughter, Lynn Nelson, 3 great grandchildren, Savanna Miller, Bo and Richard Zins; siblings, Clarence, Lawrence and Walter Santer, Lucille Pitzen, Lorraine Klimek. Funeral services for Mary will be held on Tuesday, December 11, 2018 at 11:00 am at the Immaculate Conception Catholic Church in Osakis with Fr. David Petron officiating. Interment is at the Calvary Cemetery in Osakis, MN with honorary pallbearers the members of the Osakis Christian Mothers and the active pallbearers her six sons, Daniel, Richard, Alan, Dale, Dean and Dave Zins. Arrangements by Roy-Hetland Funeral Home, Osakis, MN.